After a beautiful day out on the hills, with just enough cloud to cast some dramatic shadows over the hills, and with such a slight amount of rain in parts that it was almost as if someone had turned a hose to its mist setting and wafted it around a bit to cool everyone down, the competitors really couldn’t have hoped for more. But even better than sun and cooling mist, a gentle breeze started to blow at around 5 p.m. that is just sufficient to keep the midges at bay, so here at Glenkinglass Lodge there is a very sociable atmosphere with competitors sitting and chatting in the evening sunshine. Last night the marquee at the event centre never seemed so packed, which might partly have been due to the food and beer, but might also have been partly due to the vast swarms of midges that finally appeared outside as the sun went down and the wind dropped. But by 10:45 only the stragglers remained, with the more level headed competitors “aweee tae thir bids” in good time, knowing that they would be gently aroused at 5.45 by the lilting sound of the bagpipes. We would like to thank Mrs Sarah Troughton of Ardchattan Estate for allowing the courses to cross her land. If you are in the area, we recommend a visit to the Ardchattan Priory Garden. 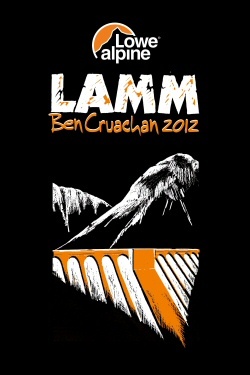 The event centre will be on the Glenstrae Estate, just north of the A85 road from Tyndrum to Oban. 3 kilometres to the west of Dalmally, you'll see a yellow LAMM sign and you'll turn right off the A85 onto the B8077. Give plenty of warning as you slow down because it is a fast road. Follow signs for a further 3 kilometres to the Event Centre. Have a safe journey. We look forward to seeing you from 3pm onwards and registration opens at 4pm. The Event Centre is at Duiletter, PA33 1AP and the arrow on this map shows the Event Centre field. If the ground is firm enough, most of the parking will be in the next field (south). Please read and print the Final Details. 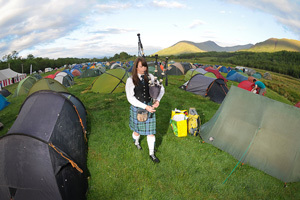 There is no accommodation available in the immediate vicinity and the best places to try are Dalmally, Taynuilt, Tyndrum and Oban if you don't wish to enjoy the convivial atmosphere on the Event Centre field. Hopefully, despite the mostly cold weather so far this year, youll have managed to get up some hills and get your hill legs working. We may be a bit further south than last year, but were still in an area with some very high hills and there are at least double the number of munros on the map compared with last year. So youll need your hill legs (although that goes without saying for the LAMM!) and possibly youll be able to add to your tally of munros, for those so inclined. There are very few paths crossing the area (or at least paths you will find useful). However a lot of the ridges, particularly around the more popular hills and near the munros, will have (unmarked) hill walkers paths on them which might be worth remembering when considering routes. Parts of the area are quite rocky, particularly in the south and north of the map and, although these will mainly be crossed by the longer courses, all courses should be careful of craggy ground at times. 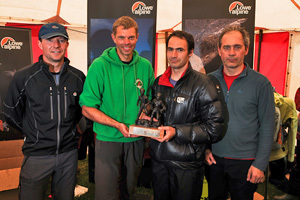 In fact the longer courses might have to be prepared to do some easy scrambling (depending on routes). In these areas also watch out for streams as some of them are in little rocky gorges which require a bit more care crossing. However, dont be put off as a lot of the map is made up of more grassy hills, some of which allow fast running, and there are some large boggy drainage basins with heather and bog myrtle - if the recent hot weather lasts any length of time, these areas could dry out considerably and again be quite fast to run across. As usual, the mid camp is a long way from the nearest road, about 10km as the crow flies (a bit more as the mountain marathoner wanders !) But despite that weve managed to get some nice short grass for you to camp on and even plenty of running water to wash in  just dont let the trout bite your toes. 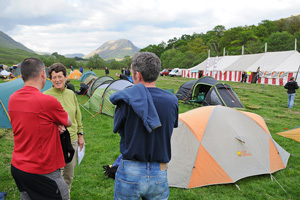 Its another spectacular setting, a campsite typical of the LAMM, with big mountains around you (real golden eagle and deer country  both seen by the organisers near the mid camp). A perfect place to relax after a hard day on the hills (midges dependent !). Keep your fingers crossed for good weather and the clouds keep off the tops, because due to the position and situation of these hills, the views from the high ridges and summits are worth a moments pause (and remember theres a photo competition).